*For the full report, download UN-Habitat's "Placemaking and the Future of Cities" here. Building inclusive, healthy, functional, and productive cities is perhaps the greatest challenge facing humanity today, and there are no easy solutions. A key part of the puzzle, though, lies right at the heart of the world’s urban areas: its public spaces. Here are ten ways you can help strengthen the social fabric of your community and jump-start economic development by creating and sustaining healthy public spaces. Placemaking is based on a simple principle: if you plan cities for cars and traffic, you will get cars and traffic. If you plan for people and places, you will get people and places. More traffic and greater road capacity are not the inevitable results of growth. They are products of very deliberate choices made to shape our communities to accommodate the private automobile. We have the ability to make different choices — starting with the decision to design our streets as comfortable and safe places for everyone — for pedestrians and bicyclists as well as drivers. A plaza at the base of a Metrocable pylon in Medellín. 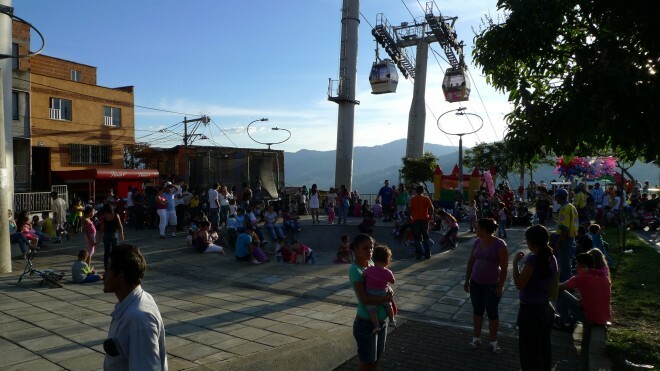 The Metrocable in the Colombian city of Medellín is a good example of transportation that enhances street life and contributes to social cohesion. The aerial tram system serves the neighborhoods on the city’s hillsides, formerly some of Medellín’s most crime-ridden and gang-infested areas. Residents of the traditionally marginalized settlements now have quick access to the city’s main subway system — a connection that used to entail a daunting walk up and down hundreds of steps or a lengthy minibus ride. When constructing the Metrocable, the city took the opportunity to invest in improving the long-neglected hillside barrios. Plazas at the bases of the pylons supporting the tram have become lively neighborhood centers with food vendors, seating, and landscaping. Parks, sporting fields, and libraries have been constructed nearby. New schools were built, and older ones improved. Pedestrian walkways link parts of the city that used to be controlled by rival gangs, and murder rates have plummeted. A great urban park is a safety valve for the city, in which people living in dense urban areas can find breathing room. While a poorly planned or maintained park can a place of fear and danger, thus repelling people, business, and investment. A great square, on the other hand, can be a source of civic pride, and it can help citizens feel better connected to their cultural and political institutions. Despite being anchored by one of the busiest train and bus stations in the city, the Las Condes plazas and commercial galleries in Santiago, Chile had become a place to pass through as quickly as possible. After the galleries were built in the 1980s, they steadily lost customers to the city’s shopping malls and became desolate — a problem that was compounded by a surfeit of entrances which made the square appealing to muggers. The Las Condes plaza area following management and public space improvements. Marcello Corbo and Rodrigo Jullian, co-founders of Urban Development, saw this well-located space as a major opportunity for both the city and their company. The project they launched to revitalize retail by improving the public space was exceptionally collaborative. 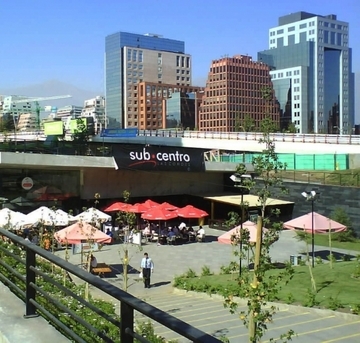 The municipality of Las Condes created new plazas and taxi stops; the Ministry of Transportation modified the street design and created new bus stops; the Metro leased the galleries to Urban Development; and Urban Development found the vendors, rented out the stalls, reduced and improved access points, and created a private team to manage the site. In 2005, Mr. Corbo invited PPS to Santiago to hold a workshop with the design team and city partners. PPS developed a series of design and management recommendations and principles that included letting in more light to make the underpasses feel safer and more welcoming, changing the park design into a plaza surface to promote more public uses, and replacing the barriers between businesses with glass panels to create a feeling of continuity and openness. The resulting effect was akin to an old-fashioned marketplace, blurring the distinction between inside and out, and between private and public. Much of the project’s success, however, had little to do with the physical renovation, and more to do with the way Urban Development developed its relationship with the community, first during the planning stage and then through creative outreach strategies since the galleries opened in March 2008. An informal public markets economy thrives in many cities around the world, but often chaotically — clogging streets, competing unfairly with local businesses, and limiting the hope of upward mobility to marginalized populations. Markets can, however, provide a structure and a regulatory framework that helps grow small businesses, preserve food safety, and make a more attractive destination for shoppers. 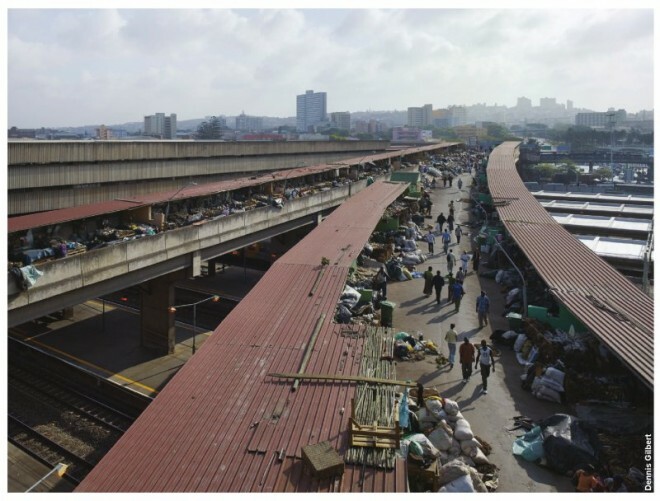 The Traditional Medicine and Herb Market in the Warwick Junction neighborhood of Durban, South Africa, was once a ramshackle and dangerous place. Vendors had to sell their goods in the open air from the pavement, and sleep on the sidewalk under a highway with their wares to protect them from thieves. Wastewater from the preparation of the local delicacy of bovine heads was drained into the municipal stormwater system, attracting vermin and clogging pipes. A redesign has changed all that. The local municipality has developed a comprehensive approach for improving local infrastructure, and the market is one of its premier projects. Government workers went to the traders and found out what they needed and wanted, then repurposed empty space in the market’s neighborhood to create enclosed stalls for vendors and locked storage spaces. Pedestrian routes have been widened, allowing easier movement for shoppers. The vendors preparing bovine heads are now equipped with sanitary cooking facilities. The result of all these improvements, informed by the very people who were to use them, has been an economic blossoming, a safer marker, and a dramatic increase in opportunities for employment and entrepreneurship. In many cities new buildings are going up at an unprecedented pace. Massive gated communities are being built for the middle class, exacerbating the gulf between rich and poor. Traditional neighborhoods are being replaced by towering skyscrapers and civic institutions like schools and libraries often end up looking like fortresses. This trend has spread around the globe and it is damaging the fabric of cities everywhere. 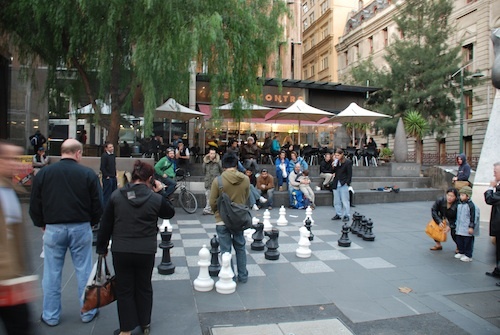 The base of Melbourne, Australia's Council House 2 adds to life on the street. Melbourne, Australia has been bucking this trend. The city sports an impressive municipal office building, Council House 2, which richly enhances the surrounding neighborhood. This is a bold, beautiful architectural accomplishment that earned Australia’s six-star Green Star rating in 2005, using innovative “biomimicry” technologies that mirror natural systems to save energy and water. But Council House 2 is more than just a showcase “green” building. At the ground level, it is dynamically connected to the surrounding neighborhood, fostering street life and creating a strong sense of place. The area around the building is enhanced by shade structures and other amenities, making this a comfortable place and an integral part of the community. It shows that “iconic” architecture need not be divorced from the urban fabric, but can exist in constant dialogue with the people and places around it. A healthy city is one in which citizens have access to basic infrastructure such as clean water, sanitation, and sewage treatment. It is also a place where healthy food is available to everyone, where women and children can walk without fear, and where people can enjoy parks, squares, and other public spaces in safety and comfort. Central Detroit is a neighborhood with a lot of basic needs. Many residents are out of work. Many don’t own cars. And the public transit system is utterly inadequate. Safety and security are a major concern. The city can’t even keep up with repairing broken streetlights. A lot of houses are abandoned and occupied by squatters. 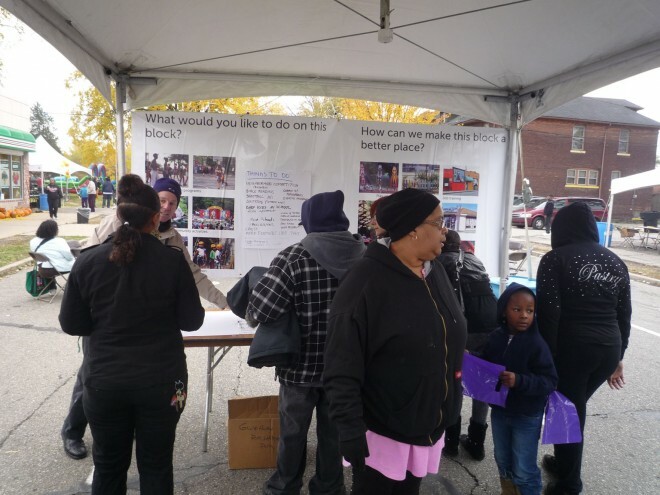 In 2011, PPS helped organize a very successful harvest festival outside the Central Detroit produce market Peaches & Greens that was undertaken with key support from the Kresge Foundation and the Central Detroit Christian Community Development Corporation. Even though Peaches & Greens is flanked by vacant lots, the festival revealed how it can be a great place for the neighborhood to come together. And many local residents expressed an eagerness to take part in more community building events. The starting point in developing a concept for any public space agenda should be to identify the talents and resources within the community -- people who can provide historical perspective, insights into how the area functions, and an understanding of what is truly meaningful to the local people. Tapping this information at the beginning of the process will help to create a sense of ownership in the project that can ensure its success for years to come. Kounkuey Design Initiative (KDI), an innovative international partnership, trans­forms impoverished communities by collaborating with residents to create low-cost, high-impact built environ­ments that improve their daily lives. 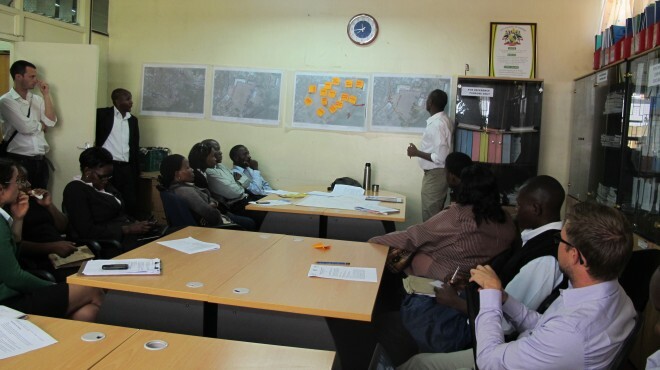 KDI believes that participatory planning and design are key to sustainable develop­ment. 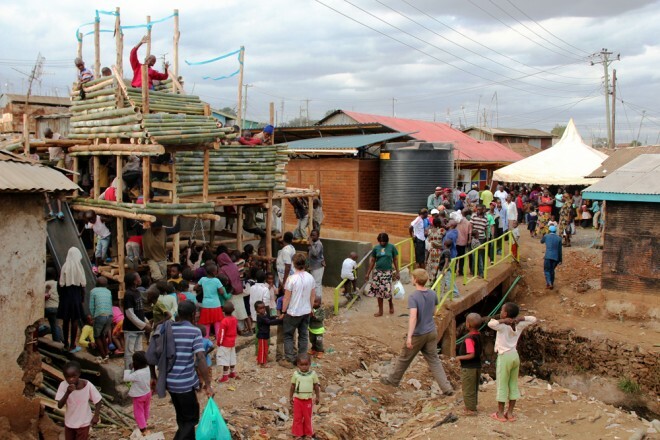 A Public Space Project they launched in 2011 in Nairobi, Kenya is a good model for how Placemakers can build on the ideas of local residents, enhance them with technical knowledge and design innovation, and empower communities to advocate for themselves. Opening celebration of the improved river area in Kibera, Nairobi. The project was in Kibera, the largest informal settlement in Nairobi. The site lies along a river running through the settlement that is used for waste disposal throughout the year and floods during the rainy season, when poor drainage along the access roads hinders the access of nearby residents to their hillside homes. The river is a play area for children, a laundry area for families, and a gathering area for residents. The KDI Kenya team conducted numerous community workshops with residents and the community-partners to prioritize needs, create design solutions, and explore micro-enterprise opportunities at the site. The resulting project design includes: a poultry farm, an improved drainage channel, flood control, a community center to house a school and health clinic, kiosks, and a playground constructed from locally sourced lumber and recycled metal. What if a neighborhood had 10 places that were that good? The area would then achieve a critical mass — a series of destinations where residents and tourists alike would become immersed in the life of the city for days at a time. Taking the next step, what if a city could boast 10 such neighborhoods? Then every resident would have access to outstanding public spaces within walking distance of their homes. That’s the sort of goal we need to set for all cities if we are serious about enhancing and revitalizing urban life. Community placemaking at work in Nairobi. The informal settlement of Kibera, in Nairobi, is home to roughly 200,000 people. It is a place where public spaces are generally overlooked. But there are exceptions, and the Silanga Sports Field is one of them. The soccer field was formerly run down, polluted, and a magnet for crime. But a local group called the Kilimanjaro Initiative has been working steadily over the last few years to upgrade it. They have leveled the field so that it is fit to play on, improved the drainage system, and started programming the space with concerts and other events. As a result, the field has been transformed from a barren, unsafe waste space and is now a magnet for the community. In order to make the space even more attractive and safe for the Kibera’s residents, PPS recently met on site with local residents and City Council Staff and brainstormed about how to create synergy and connections among the facilities already located here including a primary school, a public toilet, a community garden, a playground, river, a pottery studio, a meeting hall, and a resource center. The focus became less on the sports field and more on how to maximize the use and potential of all of the resources at Silanga Sports Field, to make it a true destination for the neighborhood, creating a ripple of positive effects. This is the Power of 10 at work. A comprehensive approach to developing, enhancing, and managing public space requires both “top-down” and “bottom-up” strategies. Leadership at the highest level of city is essential if transforma­tion of public spaces is to occur on a large scale. A “bottom-up” grassroots organizing strategy is also integral to the strategy. The first step in developing a citywide agenda is to make an honest assessment of how existing public spaces are performing — or under-performing. Communities should make note of a schoolyard that often sits empty, for instance, a lifeless plaza, a dilapidated park. The assessment should include every neighborhood and involve the people who live there as well as other key stakeholders. With this inventory, city leadership can develop a bold consensus vision. For example, in New York, the city set out a goal to carve a new “public plaza” out of existing street space in each of the 59 com­munity board districts. Such a district-by-district approach encourages residents and officials to look at their neighborhoods anew. Any public space agenda must also be tied to new development projects. Governments should take advantage of growing real estate markets in cities by creating incentives for developers to preserve and enhance the public environments that are so greatly affected by their projects. A small tax on new development, such as one recently levied successfully in Chicago, could fund many of the improvements identified in the process of creating a public space agenda. The Colombian city of Bogotá is one where the divide between rich and poor had long been in­grained in the city’s fabric, with many parts of the city suffering from economic and geographic isola­tion. Over the last 20 years, the city’s leaders, notably former mayor Enrique Peñalosa, have embarked on a citywide campaign to use public space and transportation systems to bridge the social divide and create opportunity for all of Bogotá’s citizens. 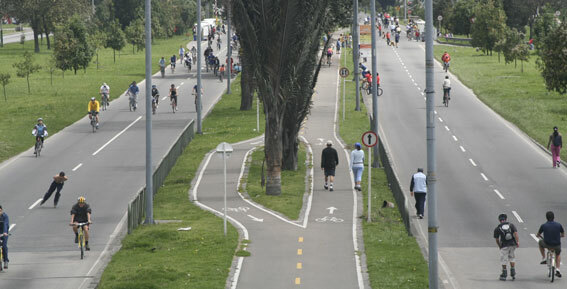 Ciclo­vía in Bogotá takes over the streets once a week. Central to the campaign has been the development of the TransMilenio bus rapid transit system, which provides fast, efficient, and reasonably priced public transportation to large areas of the city. Some 1.4 million people ride the system daily, and when it is completed there will be 388 kilometers of route, achieved at a fraction of the cost that an underground metro system would have cost. Another key aspect of the holistic approach that Bogotá has taken to its transformation is the Ciclo­vía. Each Sunday and on holidays, for several hours, most streets of the city are closed to cars so that people can enjoy biking, walking, and various recreational activities in the streets. These events have helped to raise awareness of the negative impact that car traffic has on people’s lives, and have been a key part of the city’s ongoing effort to regain street space for pedestrians and bicycles. City leaders cracked down on sidewalk parking; pedestrianized Jimenez Avenue, the main street downtown; and introduced a system that restricted car use during rush hour. Peñalosa also led an effort to increase green space and playing fields in neighborhoods around Bogotá. The result has been a decrease in crime and gang activity. Many citizens who were formerly without recreational options can now enjoy safe, healthy outdoor activities that are inclusive of wom­en and children. Public spaces are complex, organic things. You can’t expect to do everything right initially. The best spaces evolve by experimenting with short-term improvements that can be tested and refined over many years. Places to sit, a sidewalk café, a community event, a garden, painted crosswalks are all examples of “Lighter, Quicker, Cheaper” changes that capitalize on the creative energy of the community to efficiently generate new uses and revenue for places in transition. If one thing doesn't work, try something else. If you have a success, build on it. Gyrumi, Armenia was struck hard by a 1988 earthquake that left 25,000 people dead and 100,000 more without homes. In 2001, Aram Khachadurian, former PPS Chief Operating Officer, joined the Urban Institute to help build thousands of housing units for the displaced families, who were still living in temporary shelters in public spaces all over the city. With the success of this rehousing program, the central square was again available to the public, opening the way to plan its revitalization. Gyrumi, Armenia, the square full of people for the first time. In July 2003, a grant from the Academy for Educational Development (AED) brought PPS to Gyumri to facilitate the first effort since the earthquake to recapture some of the civic life that had characterized this cultural center. Local project partners included the Urban Institute and a local steering committee of architects, planners, NGOs and city officials. Despite fears that this public involvement effort would fail because, in Armenia’s 6,000-year history, participation has been virtually unknown, more than 70 people attended a daylong Placemaking workshop. The enthusiasm immediately sparked a cross-sector collaboration in the city on an unprecedented scale. The result was the “New Gyumri Festival and Placemaking EXPO,” which occurred just two months later. 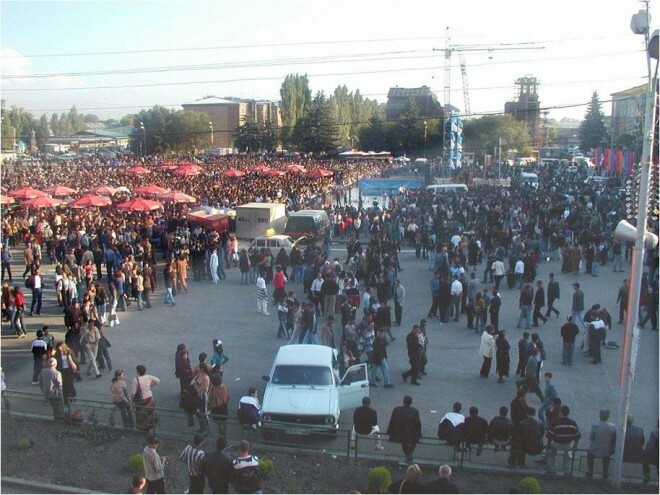 The people of Gyumri saw their square full of people (estimated at 35,000) for the first time in anyone’s memory. The lengthy list of events and improvements included: a flower market, which has since become a regular bi-weekly event; a roller-skating rink with new asphalt surfacing; a giant chessboard made out of plywood by the local chess club; seven cafés; night lighting; striping to direct traffic correctly; an installation of new street furniture; an art fair; performances, dances, wrestling matches, gymnastics, and children’s programs; flower gardens planted by the church; new banners and street signage; and daily TV news broadcasts. This catalytic event has been followed by more events on the square, and is part of a larger civic resurgence. Unfortunately, government is generally not set up to support public spaces and Placemaking. In fact, the structure of departments and the processes they require sometimes impede the creation of successful public spaces. Transportation departments view their mission as moving traffic; parks departments are there to create and manage green space; community development agencies are focused on development of projects, not the spaces in between them. Rescuing public space in Mexico with SEDESOL. If the ultimate goal of governance, urban institutions, and development is to make places, communities, and regions more prosperous, civilized, and attractive for all people, then government processes need to change to reflect that goal. This requires the development of consensus-building, city consultation processes, and institutional reform, all of which enhance citizenship and inclusion. In cities where Placemaking has taken hold, local government is often not directly involved, for example, in implementation, but relies on community development organizations, business improvement districts, and neighborhood partnerships to take the lead in making community change happen. Mexico provides a positive example of how that can occur. 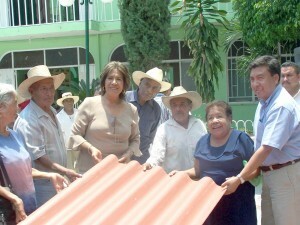 Since 2007, SEDESOL, the Mexican Ministry of Social Development, has “rescued” 42,000 public spaces across the country by promoting the realization of social actions and the execu­tion of physical works to restore community meeting places, social interaction, and everyday recreation in insecure and marginalized urban areas. The goals of the Rescue of Public Spaces program are to help improve the quality of life and safety through the revitalization of public spaces in cities and metropolitan areas across Mexico, thereby promoting healthy living. Furthermore, the initiative is intended to link urban development to social development; promote community organization and participation; increase community safety and prevent antisocial activity; and help strengthen the sense of community belonging, social cohesion, and equitable relationships among genders. For the full report on which this list is based, download UN-Habitat's "Placemaking and the Future of Cities" here.